At The Rosemary Company, we’re very interested in what you like, so we can better server you. That’s why we’ve put together our Bestselling Favors pages. Our #1 Bestselling Bridal Shower Favor is our Crystal Rose Favor. Good things come in small packages and this indulgent miniature measures a dainty 3 1/2″ in length and features a luminous crystal bud atop a silver metal stem with embossed leaves. Surrounded by satin, inside a signature silver heart design box (4 1/4″ x 1 7/8″), these favors are stunningly detailed. Finishing touches include an organza and satin bow topped with a crystal heart and an attached matching heart shaped tag. *Crystal is clear and colorless. #2 is our Personalized Tea Favor with Caddy. We have a large variety of different designs, colors, and fonts for you to choose from to create your own special favor. 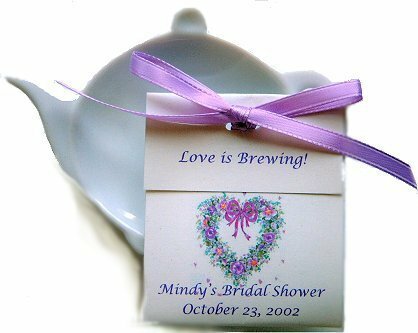 Personalized tea bag available in several attractive designs, topped off with a porcelain teapot-shaped caddy. Teabag packaging is 3.25″ x 2.75″, teapot dish / caddy is 4.75″ x 3.25″. Imprint the name of the bride-to-be or couple and the event date – any two lines of your choice. Champagne Fillable Favor Bottles is #3 for bestselling favors. This favor is sooo versatile! Large 8″ tall and 2 1/2″ in diameter. This is a very popular favor for baby showers, birthdays, retirements, and more! The top of each bottle is wrapped with gold foil and shaped to resemble an actual champagne bottle. 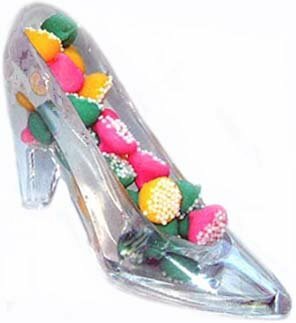 The bottom of the fillable favor bottle unscrews, and anything from candies to favors to a special message can be placed inside the bottle.The right fit for your party: this Cinderella Slipper Fillable Favor! #5 is our Dressed to the Nines Tuxedo or Gown Mint Tins. Metal tins in a black and white Tuxedo or sophisticated Gown design add style and flair to your tables. Mix and match for all the ladies and gentlemen sharing in your special day. Wrapped in individual clear poly bags, each tin measures 2 ¼” by 1 1/8” and makes a noteworthy container for any number of personal trinkets once your guests take them home. Minimum order of 12 of either design. (You’ll surely want some of each!). To view #6 – #10, click here.